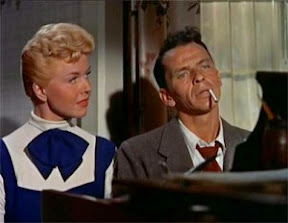 Because the opening lyrics of the hit Frank Sinatra title tune upon which director Gordon Douglas’ eponymous film derived its name promises that “Fairy tales can come true,” you might just expect the 1954 Sinatra picture that first paired him up with America’s virginal sweetheart Doris Day to be as lighthearted and happy as one of his number one songs. Unfortunately as we learn in this surprisingly downbeat music-infused remake of the 1938 smash Four Daughters (which spawned two sequels as part of its female friendly franchise that followed the gifted daughters’ romantic adventures as Wives and Mothers respectively), you’d be wrong in your assumption that it's a feel good fairy tale. No, the oddly named remake takes us on a two to three hankie journey of coming-of-age heartache and woe in its more manageable tale of three (versus the earlier Four) daughters from a tight-knit musical family. 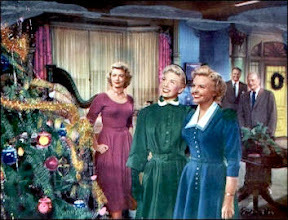 Originally derived from Fannie Hurst’s story “Sister Act” and adapted for the screen by scripter Liam O’Brien, the film focuses on the beautiful trio of siblings played by Dorothy Malone, Doris Day and Elizabeth Fraser whose future fates as well as their relationships with one another are tested when all three find themselves falling in love with a young composer. 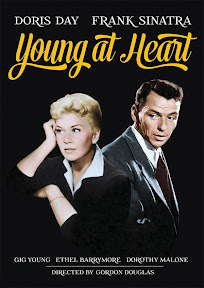 While you’d assume the heartthrob would be none other than Ol’ Blue Eyes, Young finds the then young blue eyed Sinatra playing against type while taking a backseat to the object of the women’s affection in the form of Gig Young. As the film picks up momentum, Gig Young’s Alex Burke arrives for what was intended to be a short period of living and working in the home of their conductor and musician father (Robert Keith) only to wind up moving in for good. 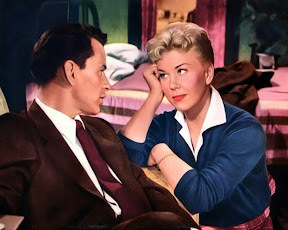 An affable flirt who is seemingly oblivious to his effect on two of the otherwise engaged sisters (Malone and Fraser), Alex finds an unexpected romantic rival when his talented musical arranger and old friend Barney Sloan (Sinatra) arrives at the crowded Tuttle family home and sets his sights on Burke’s girlfriend (Doris Day). A depressive pessimist who’s perpetually down on his luck, the troubled Barney forms a surprising bond with Day’s ever-cheerful Laurie. Unaware how much he likes her, the kindhearted Laurie aspires to give the talented piano man the confidence and newfound lease on life he needs to turn his life around… even at the cost of her relationship with Alex. Moving awkwardly in tone from the lighthearted ‘50s musical spin on Sense and Sensibility-like courtship it initially used as a jumping off point, Young at Heart segues into even darker near Star is Born terrain seemingly out of left field as it reaches its climax. However, one saving grace in what would otherwise have been a far too emotionally manipulative, bleak film was Sinatra’s confidence to pull rank offscreen about his unconfident character onscreen. Wisely using his rising star power for good rather than ego, Sinatra ensured a more suitable (happier) ending than the unspeakably devastating finale that had been originally planned. While usually adhering to the filmmaker’s vision is the most important rule for an actor to follow – having perished in two previous pictures before signing onto this one, Sinatra was able to gauge the difference in the emotional payoff and instinctively knew that unlike the earlier films, Young at Heart needed to change its course. And his collaborative approach paid off as this marked the first of five films that Douglas helmed for Sinatra including The Detective and the Rat Pack comedy Robin and the 7 Hoods. The only filmmaker to direct both Sinatra and Elvis Presley, the prolific Douglas had an eye for talent and aligned himself with the very best behind-the-scenes professionals to complement the star power in front of the camera. 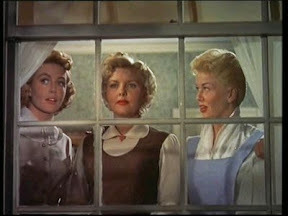 Beautifully photographed by future Sound of Music cinematographer Ted D. McCord, who also showed his rising artistry one year later with the expressionist flourishes he served up in Elia Kazan’s influential East of Eden, Young at Heart is likewise given a few undisputed dashes of creativity that help elevate it from standard soap operatic studio fare. 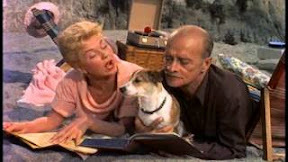 Illustrating the passing of time in tandem with Hitchcock’s Strangers on a Train editor William Ziegler by cutting from a shot of a newborn puppy to the now-grown dog running along the beach, Young at Heart’s sheer cinematic beauty helps keep the audience engaged between Day and/or Sinatra’s sweetly sung renditions of Gershwin standards and period hits. Bolstered by its talented ensemble cast that also includes Ethel Barrymore, Young at Heart captures Sinatra on the cusp of superstardom in a film (and role) that despite its melancholic timbre, provided him with a great opportunity following 1953’s From Here to Eternity to showcase his growing range from mere singer in a movie to character actor.